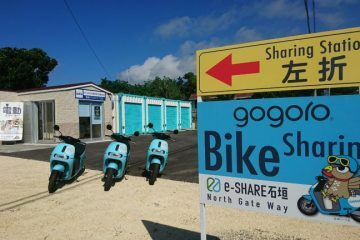 GOSHARE is the electric scooter rental service.Enjoy the electric bike ride in Ishigaki,Okinawa. ◇Is there any free pick-up service? ◇What driving license is required? ◇Can we ride double on a scooter? ◇Where can we rent a scooter? ◇What to pay attention to when driving? Is there any free pick-up service? What driving license is required? Can we ride double on a scooter? Where can we rent a scooter? What to pay attention to when driving? 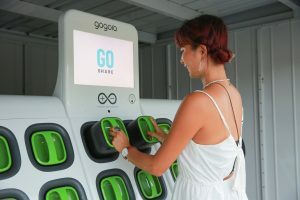 2018.08.07Bloomberg news about gogoro electric scooter starting in Japan, Ishigaki Is. 2018.12.02Can We Drop Off The Scooter @ The Airport?? filled with a range of fascinating natural environments. share it with others around the world and protect it for future generations. We aim to build an island that aspires sustainable development through the creation of new value. captivates people from around the world. Ishigaki is the third largest island in Okinawa. surrounded by a huge blue coral reef that is touted as the largest in the northern hemisphere. and knowing you’re helping take care of it? made possible with the gogoro Smartscooter. 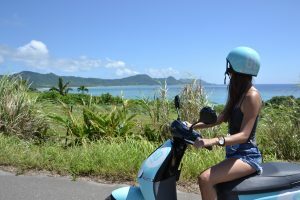 Ride an electric scooter and discover new spots that are hard to reach on a bicycle around Ishigaki! Swap out used batteries at a charging station with ease, even in out-of-the way places. Runs on electricity, not gasoline. Experience the ultimate in green touring by using solar-generated electricity. With its sleek design, the gogoro scooter is the perfect complement to your trip. Get the exhilarating sensation you won’t get from your normal moped as you experience speed with this electric scooter. Book a scooter by phone or email. ※Price includes scooter rent fee, helmet rent fee, battery swap fee, and insurance fee.→About insurance ? see HERE. ※From 4 hours till 24 hours use, the price will be the same. When you arrive to pick up your scooter, give your name and booking number. Our local staff will teach you how to operate and ride the scooter. Now all you have to do is tour Ishigaki Island's numerous attractions and sights in comfort and at your leisure. Replacing batteries at a charging station is easy. Simply swap out two fresh batteries, automatically dispensed from the station when you insert the two used batteries from the scooter. Battery swapping is free of charge. You can swap out the battery shortly, so never need to wait for battery charging. This is what makes Gogoro electric scooter different from conventional electric bike or scooter. Q. Can we ride double? You may ride double on 125cc type scooter. 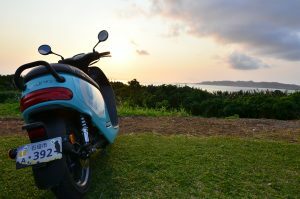 It is prohibited in Japan to ride double on 50 cc type scooter. Q. Can anyone use the scooter? If you have a driver’s license, you can use them. But if we determine that issues may arise from your rental, we reserve the right to refuse service. Q. Can I rent on the spot without a reservation? Yes. You can visit us directly to hire a scooter. However, we do recommend you make a reservation, as we may not have any scooters available at the time. Q. Can I cancel a reservation? Q. Can I extend my rental time? You can if no one else has a reservation for that time. Q. Can foreign nationals rent too? Q. What is maximum driving range of the electric scooter on condition of full charged batteries? The driving range is approximately 80 km, but it can vary depending on number of passengers, accelerator position degree and etc. Q. Can I rent a helmet and raincoat as well? The helmet can be provided and the rent fee of helmet is included in basic rent fee. The raincoat (size: 120cm) can be provided, too. ※The raincoat is in limited supply and may run out of stock. Q. How long can I use the scooters for? As long as you return them within our business hours, you can use them as long as you like. Q. I missed the deadline for returning the scooter. What should I do? Charges are based on how many hours you use the scooter, so you will need to pay additional charges. Q. Is the battery swapping cost included in the rental fee? Yes. Additional cost is not charged regardless of number of battery swapping times. Q. What should I do when my batteries run out? Head to the nearest charging station to replace the batteries. If that is not possible, call us on the following number. Q. Where are the charging stations located? You can find them in 5 locations around Ishigaki Island. Check the locations on the map here. Q. What should I do if my gogoro scooter suddenly stops working? Q. What do I do about thefts, accidents or losing the key? Q. Are the scooters insured? Q. What model of scooter can we rent? It is the scooter manufactured by Gogoro Inc. whose model is “Gogoro 2 Plus”(blue color) of 2017. Q. 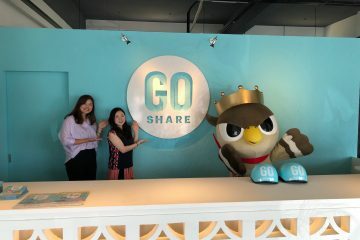 Can I buy my own gogoro scooter? We do not sell scooters at present. Q. Can I cancel the rental after riding the electric bike? ①Cancellation within 20 minutes after riding the bike because you feel afraid to drive safe ・・・0% of the rental fee. ②Cancellation within 20 minutes after riding the bike due to the weather suddenly worsened ・・・0% of the rental fee. ③Cancellation due to any reasons other than above-mentioned ① or ② in case of rental more than 2 days ・・・ 50% of the paid rental fee for the rest of the days you don’t ride. ④Cancellation due to any reasons other than above-mentioned ① or ② in case of rental within 1 day ・・・ 100% of the paid rental fee. Q. Can I return the scooter out of business hour(before 9:00/after18:00)? Yes. There is additional handling charge 1,000JPY per unit. Please inform us in advance of the return out of business hours. © 2018 e-SHARE Ishigaki Co., Ltd.